«We are excited to partner with Boeing as we assist Japan in advancing its aerial refueling capabilities», said Brigadier General Donna Shipton, program executive officer, U.S. Air Force Tanker Directorate. «This is an important step in strengthening the U.S.-Japan alliance and will enhance our interoperability with both nations flying KC-46s». «This milestone order highlights a valued partnership with Japan that spans more than six decades, and we look forward to continuing that collaboration on the KC-46 program», added Brett Gerry, president, Boeing Japan. «The skilled Japanese KC-767 tanker and E-767 Airborne Warning and Control Systems pilots and maintenance personnel are already familiar with flying and supporting our highly efficient aircraft, and we look forward to helping them expand their capabilities in the future». The first Boeing KC-46A Pegasus tanker that will be delivered to the U.S. Air Force next year successfully completed its first flight and airborne tests on December 5, 2017, taking off from Paine Field at 10:32 a.m. PST and landing approximately three-and-one-half hours later. The U.S. Air Force today awarded Boeing $2.1 billion for 15 KC-46A Pegasus tanker aircraft, spare engines and wing air refueling pod kits. This order is the third low-rate initial production lot for Boeing. The first two came in August 2016 and included seven and 12 planes, respectively, as well as spare parts. Boeing plans to build 179 of the 767-based refueling aircraft for the U.S. Air Force to replace its legacy tanker fleet. Tanker deliveries will begin later this year. 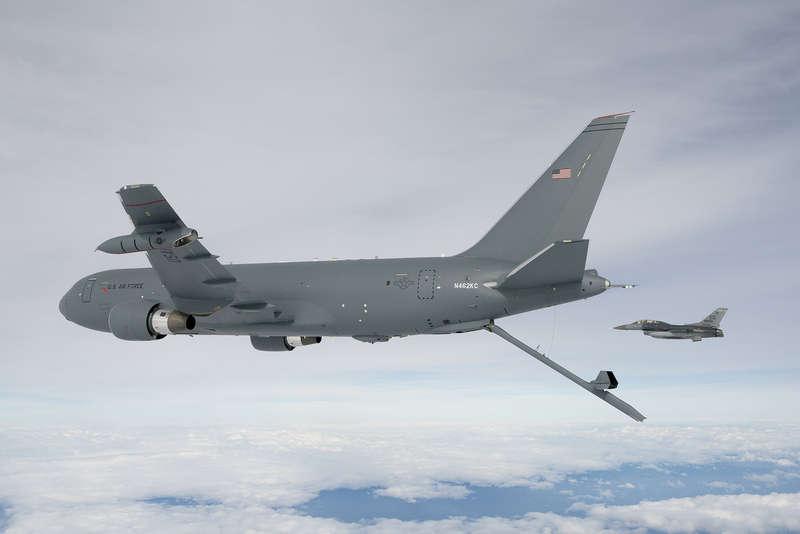 «This award is great news for the joint Boeing-Air Force team and reinforces the need for this highly efficient and capable tanker aircraft», said Mike Gibbons, Boeing KC-46A Pegasus tanker vice president and program manager. «Our Boeing industry team is hard at work building and testing KC-46 Pegasus aircraft, and we look forward to first delivery». 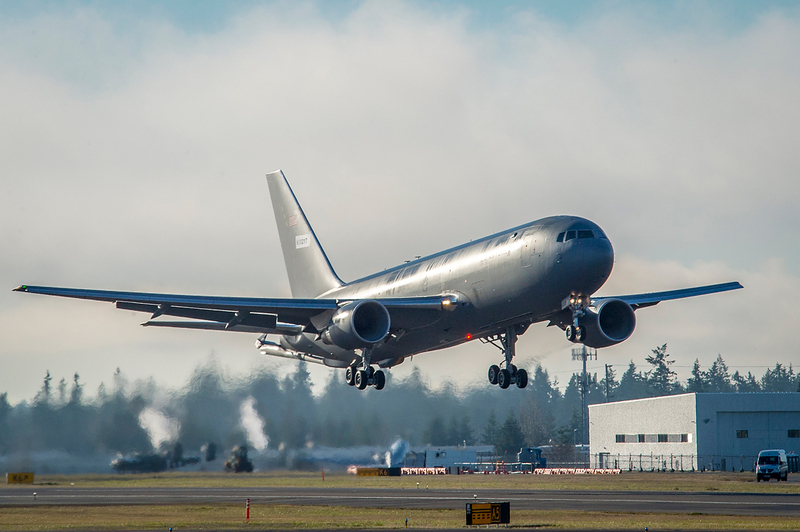 «Placing an order for another 15 aircraft is another important milestone for the KC-46 Pegasus program», said Colonel John Newberry, U.S. Air Force KC-46 Pegasus System program manager. «I know the warfighter is excited about bringing this next generation capability into the inventory». Boeing received an initial contract in 2011 to design and develop the U.S. Air Force’s next-generation tanker aircraft. As part of that contract, Boeing built four test aircraft – two configured as 767-2Cs and two as KC-46A Pegasus tankers. Those test aircraft, along with the first production plane, have completed nearly 1,500 flight hours to date. Boeing is assembling KC-46 Pegasus aircraft at its Everett, Washington, facility. 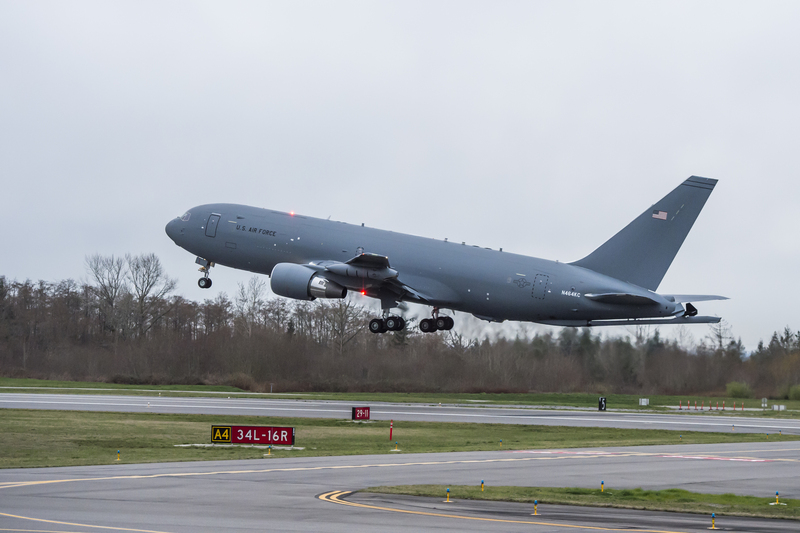 The Boeing test team successfully completed the first flight of the program’s second KC-46A Pegasus tanker aircraft on March 2, taking off from Paine Field and landing later at Boeing Field in Seattle. During the flight, Boeing test pilots performed operational checks on engines, flight controls and environmental systems. 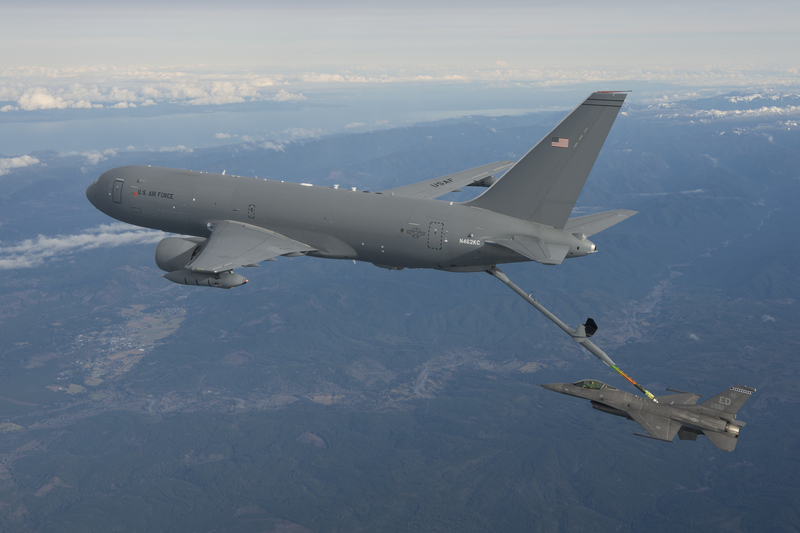 «Adding a second tanker to the flight test program is very important as we move into the next phase of testing», said Colonel John Newberry, U.S. Air Force KC-46 System program manager. «The team will initially use the aircraft to test mission system avionics and exterior lighting. Later, it will share the air refueling effort with the first KC-46». The Boeing team now will conduct a post-flight inspection and calibrate instrumentation prior to the next series of flights. As part of the overall flight test program, the KC-46 Pegasus will demonstrate it can refuel 18 different aircraft. The second tanker will help share the test load and receiver certification. Boeing was awarded a contract in 2011 to design and develop the U.S. Air Force’s next-generation tanker aircraft and is building four test aircraft – two are currently configured as 767-2Cs and two as KC-46A Pegasus tankers. Engineering & Manufacturing and Development-1 (EMD-1), a 767-2C test aircraft, has completed more than 260 flight test hours to date since its first flight in December 2014. EMD-2, the program’s first KC-46A Pegasus tanker, made its maiden flight September 25, 2015 and has now completed more than 180 flight test hours. EMD-3, a 767-2C, will begin flight testing later this year. The KC-46A Pegasus is a multirole tanker Boeing is building for the U.S. Air Force that can refuel all allied and coalition military aircraft compatible with international aerial refueling procedures and can carry passengers, cargo and patients. Overall, Boeing plans to build 179 KC-46 Pegasus aircraft for the U.S. Air Force. Boeing and U.S. Air Force aircrews successfully completed the KC-46A tanker’s first refueling flight on January 24 in the skies above Washington state. 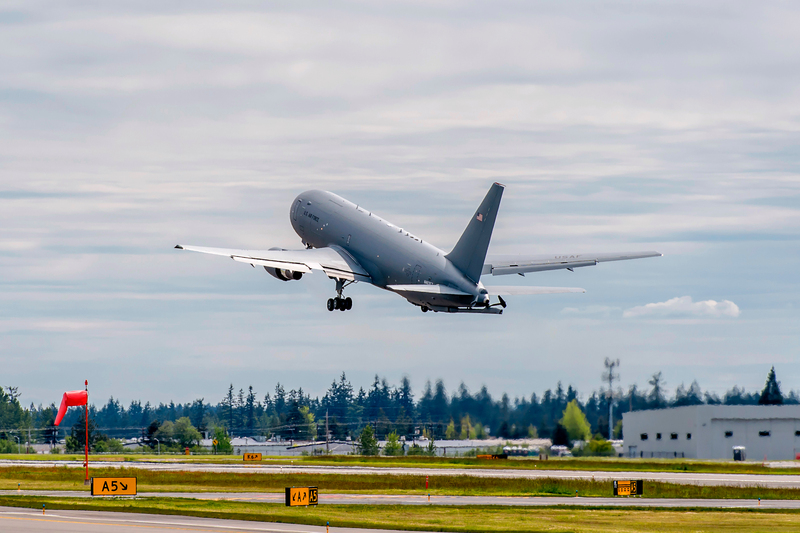 Following takeoff from Boeing Field in Seattle, the KC-46A test team worked through a series of test points before smoothly offloading 1,600 pounds/726 kg of fuel to an F-16 fighter aircraft flying at 20,000 feet/6,096 meter. 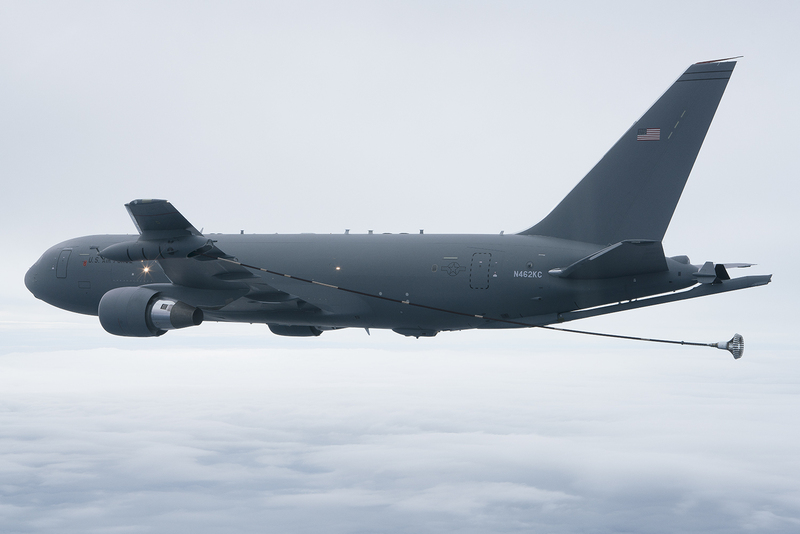 «Today’s flight is an important milestone for the Air Force/Boeing team because it kicks off the Milestone C aerial refueling demonstration, which is the prerequisite for the Low-Rate Initial Production (LRIP) decision», said Colonel Christopher Coombs, U.S. Air Force KC-46 system program manager. 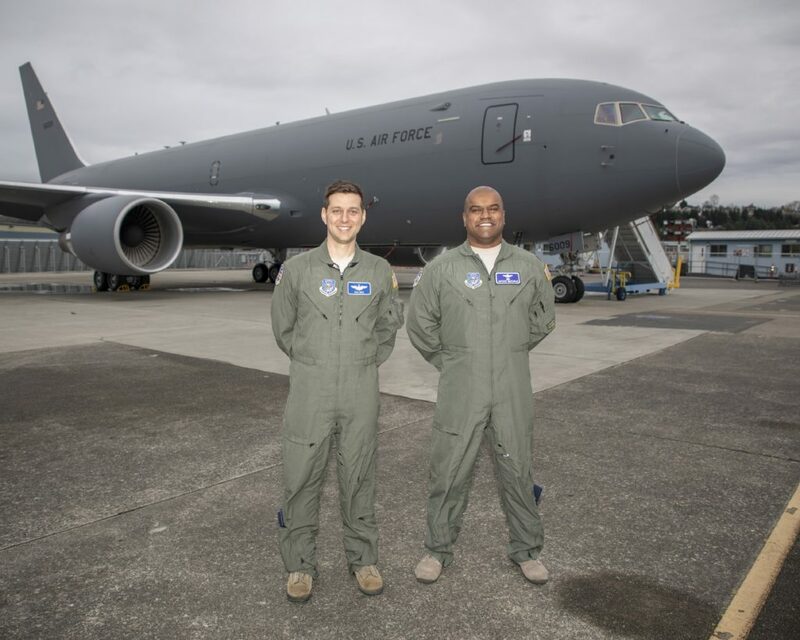 «We have a lot of work yet to do, but this is an exciting time for the airmen who are preparing to fly, maintain and support the KC-46 Pegasus for decades to come». During the 5 hour and 43-minute flight, both Boeing and U.S. Air Force air refueling operators accomplished multiple contacts with the F-16 that confirmed the system was ready to transfer fuel. Master Sergeant Lindsay Moon, U.S. Air Force KC-46 air refueling operator, then «flew» the tanker’s 56-foot/17-meter boom downward and waited for the F-16 to move into position before fully extending the boom into its refueling receptacle. «The KC-46 offloaded fuel to the fighter and when the fuel transfer was complete, the system automatically turned off the pumps and Moon smoothly retracted the boom. The refueling boom’s handling qualities throughout the flight were exceptional», said Rickey Kahler, Boeing KC-46 air refueling operator who also guided the boom during contacts with the F-16 while sitting in the tanker’s state-of-the-art refueling operator station in the front of the tanker. «The boom was extremely stable – it handled like it was an extension of my arm». 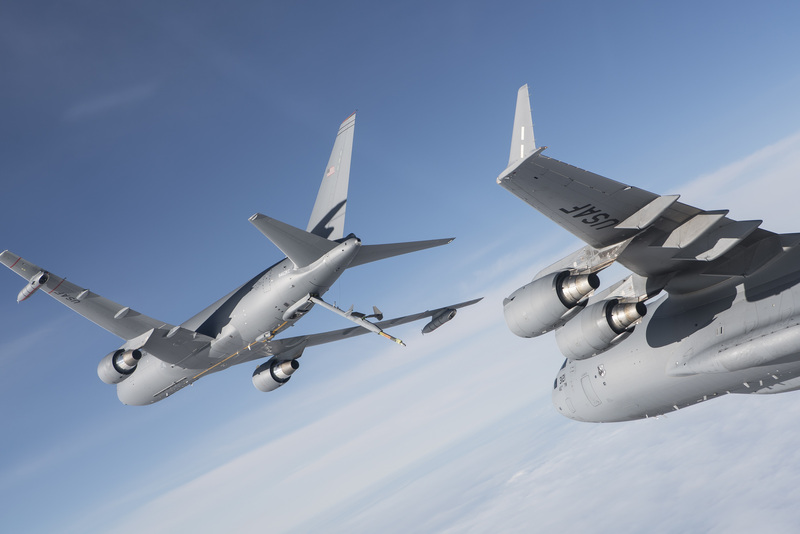 The KC-46A that accomplished today’s refueling milestone will soon begin refueling a number of other military aircraft as well, including a C-17, F/A-18, A-10 and AV-8B. Also known as Engineering & Manufacturing Development-2 (EMD-2), the tanker made its first flight September 25, 2015 and has now completed 32 flights. 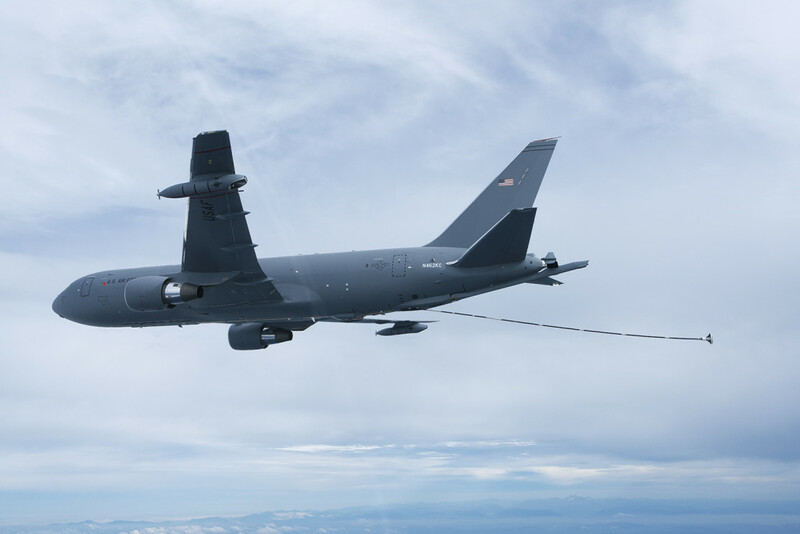 The KC-46A Pegasus notched another success this week when the systems at the heart of aerial refueling were demonstrated on Engineering, Manufacturing and Development 2 (EMD-2) with the deployment of both drogue systems and the boom. On October 8, EMD-2 successfully extended the drogue refueling baskets from both the Centerline Drogue System (CDS), located on the belly of the fuselage, and from the Wing Aerial Refueling Pods (WARP), located on the wing tips, for probe receiver aircraft. On October 9, EMD-2 extended the boom, the telescoping tube, which an operator on the tanker aircraft extends to receptacle-equipped receiver aircraft. «The core mission of Pegasus is to fuel the fight, so deploying the boom and drogues signals real progress toward demonstrating the ability to pass fuel in flight», said Brigadier General Duke Z. Richardson, the program executive officer for tankers at the Air Force Life Cycle Management Center. «This sets the stage for the main act, which is hooking up to and refueling an aircraft in flight». The rigid, centerline boom used on the KC-135 Stratotanker and KC-10 Extender, has been the Air Force standard for in-flight refueling since the 1950s. With a 1,200 gallons per minute transfer rate from the KC-46, the boom will be the fastest way to refuel. Like all previous tankers, the Pegasus can refuel a single aircraft at a time on the boom. On the other hand, Air Force helicopters and all Navy and Marine Corps aircraft use the hose and drogue method of refueling. The two drogue systems on the KC-46, CDS and WARPs, pass fuel at a rate of 400 gpm, and the WARPs can refuel more than one aircraft at a time. The KC-46A is a leap forward, as it can conduct boom and drogue refueling on a single mission without landing to reconfigure. 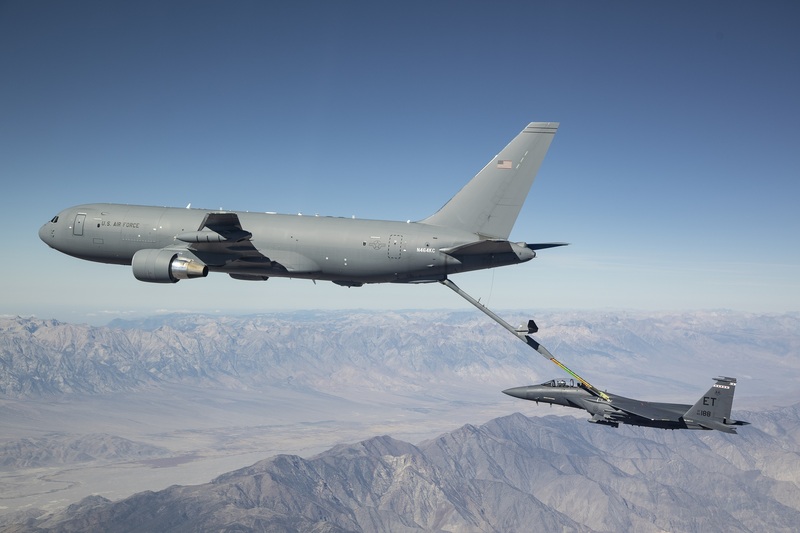 «These capability gains are vital to the tanker mission in support of global reach and global power providing the U.S. military the ability to extend the range of aircraft to respond wherever it’s called to duty», said Colonel Christopher Coombs, the KC-46 system program manager. «This tanker will be able to refuel any fixed-wing aircraft or helicopter in the (Defense Department) fleet, while being able to take on fuel itself». The Air Force contracted with Boeing in February 2011 to acquire 179 KC-46As to begin recapitalizing the aging tanker fleet. The program is currently working to meet the required assets available date, a milestone requiring 18 KC-46As and all necessary support equipment to be on the ramp, ready to support warfighter needs by August 2017.